Today Jackalie and I went to Bratislava, Slovakia. If you had asked me what I knew about Bratislava 6 months ago, I would have know nothing- not its location or anything. Bratislava is about an hour away from Vienna, and Vienna and Bratislava are among the closest capital cities in the world (less than 34 miles apart). Both cities lie on the Danube, and both have a long, and in many cases, painful history related to the occupation of the Germans and the Russians. Another cool fact is that Bratislava is the only national capital that borders two independent countries (Austria and Hungary). It was gorgeous, and Jackalie and I had such a spectacular time exploring – our timing could not have been better. We started with a bit of a parking adventure (The Cyrillic alphabet made for quite an adventure) and then wandered into a church we saw in the immediate area. 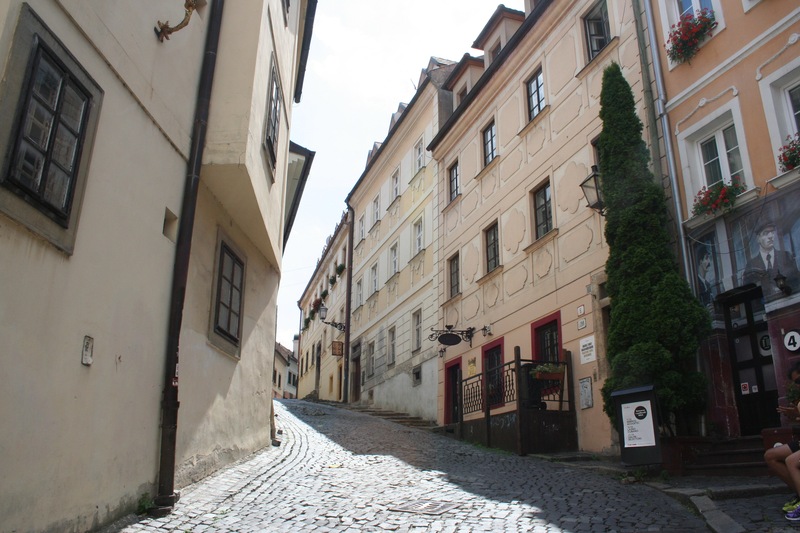 We knew we wanted to visit the Hrad, or Castle on the top of the hill, but to get there we had to navigate the public transit system – without a map – but by asking for some help, we ended up meeting friendly Slovak who guided us on our way, and we were headed to the Hrad. The Hrad has a neat and unique history, and has recently been reconstructed following a fire that left it in shambles for many years. The building is now used as the Slovakian National Museum, and we were both impressed that it survived the tumultuous history and continued occupations that have shaped Slovakia. When we got to the Hrad, we enjoyed spectacular mountaintop views of Bratislava on both sides of the Danube – It was amazing! We bought our tickets for the Hrad, and discovered that there was a display of Historical Church Paraments. The church geeks in each of us were quite happy about that. We spent HOURS in the castle, and had a wonderful time! We stopped at the bottom for an Original Budweiser and some water, and we enjoyed the spectacular view of the old city walls. Moving on from there we explored the church where they held the coronations for the Austria-Hungarian Empire, and it was stunning. We continued our explorations by wandering around the town center – and we stumbled upon a music festival, so we had a beautiful soundtrack to our explorations and lunch. At lunch I decided to try a traditional Slovakian dish. It was a sweet dish, but very yummy – here is the menu and a picture of the Slovakian meal – It was really good, but sweet. We wondered a bit more, then we headed back to Vienna. We enjoyed sitting outside and chatting on a lovely Vienna evening, and then to further my culinary exploration, we went to an Afgani Restaurant. It was excellent! How wonderful to discover these hidden gems! It”s amazing that they’ve survived all the centuries of war and strife. Nothing like having local friends to guide you on the inside track! I spent my 38th birthday in Vienna on the way to pick up Sam in Latvia. The castles, gardens (both beer and floral,) chocolate, coffee, ferris wheel, and surrounding landscape from river to mountain made for a birthday never to be forgotten. Keep enjoying and appreciating which are mutually exclusive!